For a spicy dipping sauce, add yogurt, ketchup, ground sweet paprika, hot sauce, salt, pepper, and chili powder to taste in a small bowl. Mix well and enjoy! 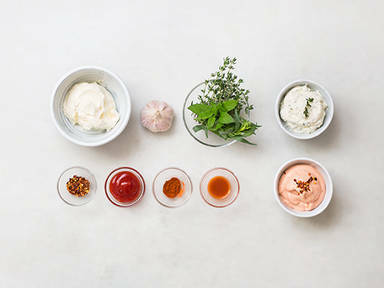 For a fresh herb dipping sauce, freshly grated lemon zest, finely minced garlic, and finely minced thyme, parsley, and tarragon to a small bowl. Add a drizzle of olive oil, salt, and pepper. Mix well and enjoy!